« 2011 Gingerbread Houses in Maja’s Kitchen! My friend Nancy will be a first time grandmother…and she hardly can wait for the moment to hold this precious little bundle in her arms…. And….of course the new mom is anxiously awaiting the moment when she will finally see her precious little baby….but today was the day of the Baby Shower, and my cake was a part of that occasion…. Here are a few pictures of the cake….. This was a Vanilla Cake, each layer was brushed with brandy, then came a layer of an orange flavored butter cream, topped with home-made peach jam…there were five layers in the cake.. The outer icing was the orange flavored butter cream…..at this point I placed the cake into the refrigerator to blend the flavors. 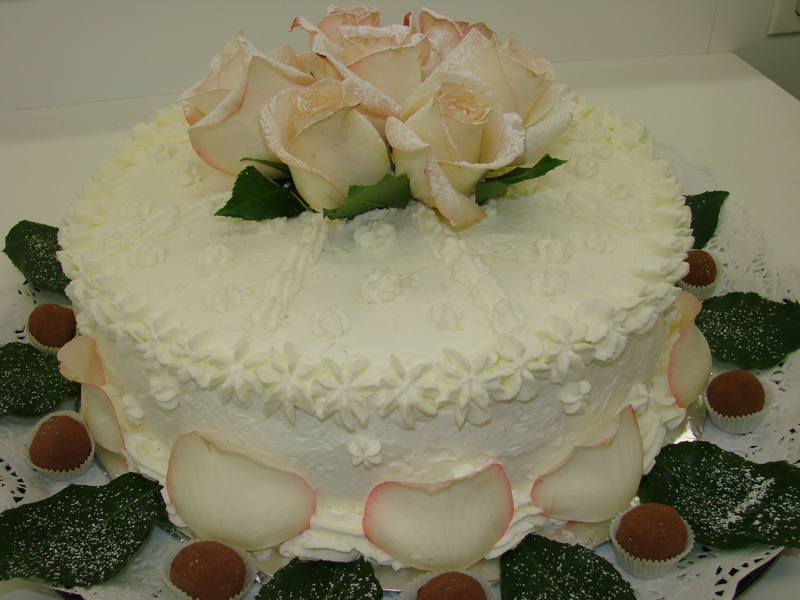 This morning I coated the cake with whipped heavy cream, and decorated it with rosettes of whipped cream and the real roses…. 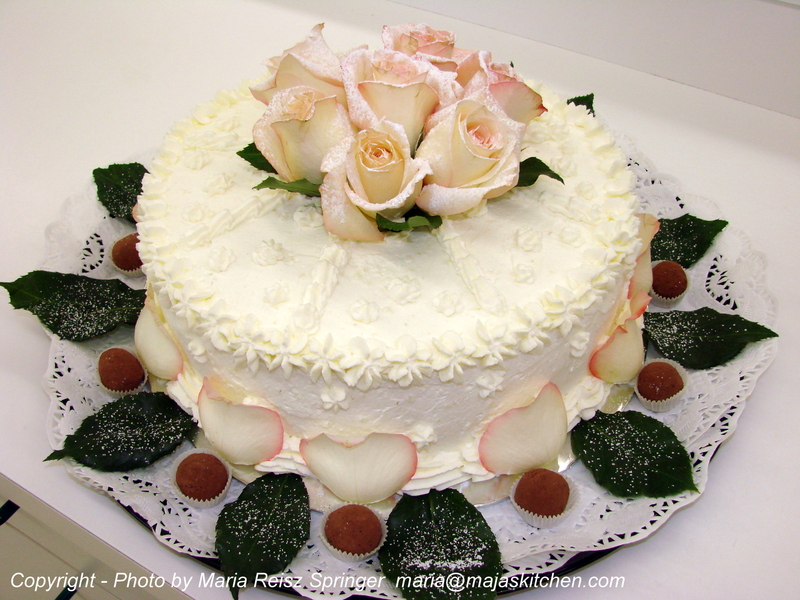 I love to decorate cakes with fresh flowers…This time is was a very beautiful rose that had the color of cream and every petal had a touch of pink around it…it was really quite exquisite…. 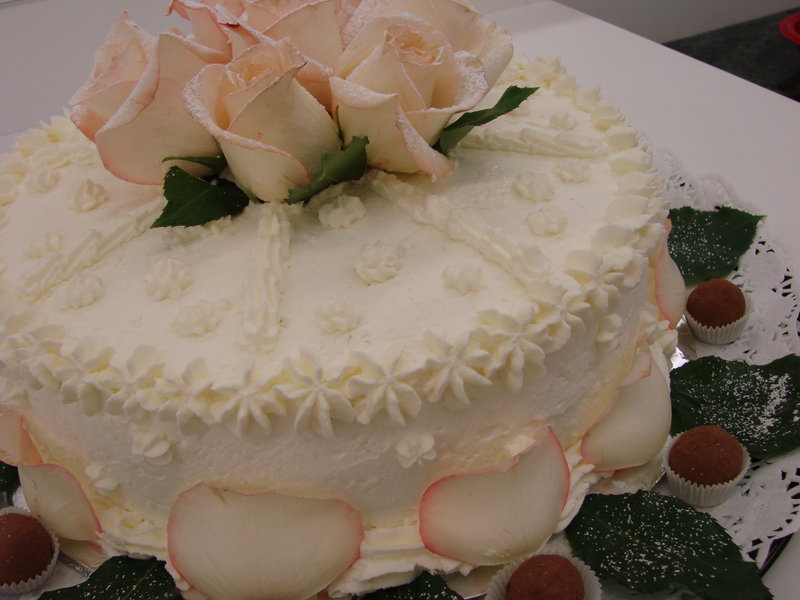 For a special effect I placed some rose petals around the cake to give it an airy feeling, sort of floating and light…. Some of the green rose leaves I used to give the cake a base, they were spaced in equal distances in order to allow some space for a chocolate truffle between them. 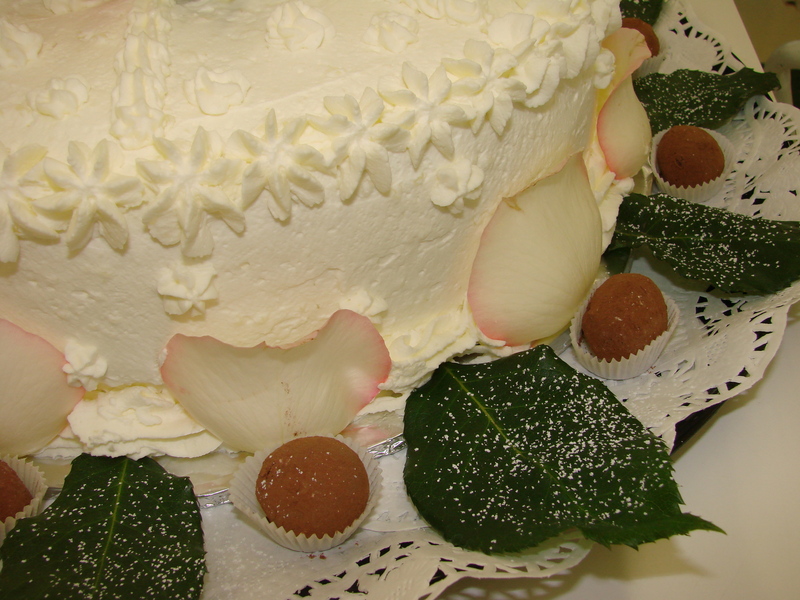 I made the truffles last evening just to be a part of this celebratory cake…. This sounds delicious and what a presentation! Thank you for your nice comment….the Orange Butter Cream is my absolute favorite as well….next to a coffee butter cream that I use in Yule logs….watch for my next post….the Yule Log…. And…welcome to my blog followers…..